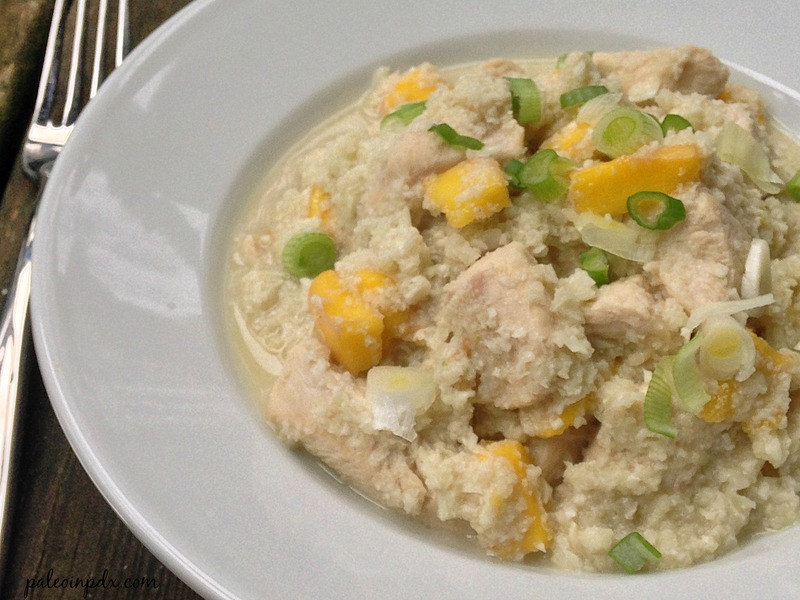 This chicken coconut mango “rice” turned out so delicious! The lime is very abundant and zesty, while the mango adds just the right amount of sweetness. It pairs well with the savory chicken and creaminess of the coconut milk. The house smelled wonderful while this was cooking, which I mostly attribute to the kaffir lime leaves. If you can’t find kaffir lime leaves, omit them and add a little bit more lime zest. Also, I turned the big 3-0 on March 2nd and celebrated both on my own (took the day off and got a 90 minute massage) and with Jesse that day. Since my birthday was on a Monday, I celebrated with friends out in wine country the following weekend and it was a gorgeous 70 degree day. Heat the oil in a large skillet or wok over medium heat. Add the chicken and jalapeño, and season to taste with sea salt. Sauté until cooked through, about 5-7 minutes. While the chicken is cooking, pour the coconut milk, broth, fish sauce, lime juice and zest, kaffir lime leaves and ground ginger into a small pot over medium heat. Mix well and simmer until the liquid has reduced down a bit. Pour the coconut milk mixture over the chicken and stir. After 1-2 minutes, stir in the cauliflower rice and season to taste with sea salt. 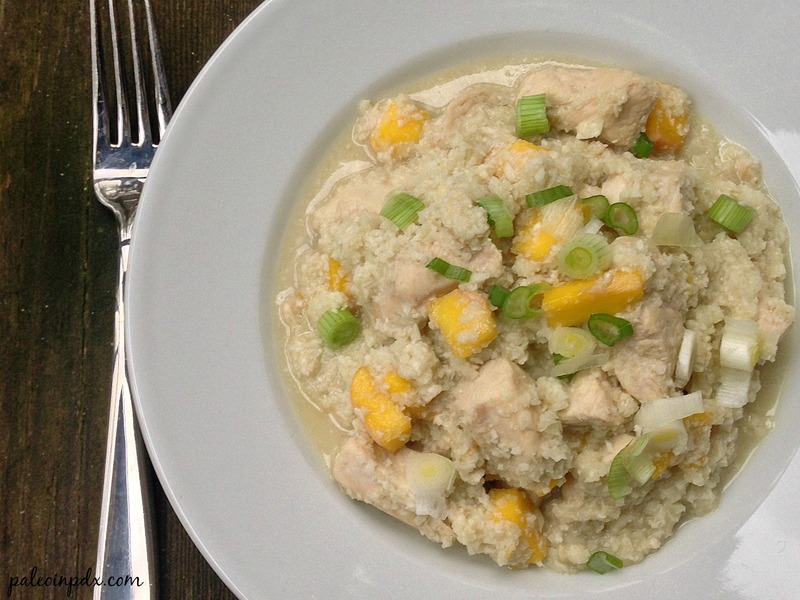 Cook until the cauliflower rice softens slightly. Then, stir in the mango and cook about one minute more. Serve and garnish with sliced green onion. I must try this–I like Thai inspired recipes! Do you have to go to a specialty/ethnic grocery to find kaffir lime leaves? I haven’t seen them at the usual big retailers (meijer, kroger). Happy belated birthday–a massage sounds like the perfect way to celebrate!! Thanks for the belated birthday wishes, Paula! I actually got the kaffir lime leaves at a local co-op. They had them packaged in individual little containers that you could buy for $0.99 and it came with 10 leaves inside. They are hard to find, but if you have a health food store or Whole Foods near you, I’d check there. Happy belated bday! This recipe totally looks up my alley right now. I’ve been in a curry-ish kind of mood with dreams of tropical places, so this looks like it would fit the bill perfectly! Can’t wait to make it! Thanks, Michele! I hope you enjoy the recipe if you get a chance to try it! Hi, could you tell me what Co-op you go the kaffir lime leaves at? I live in Portland too (NW 23rd area) and haven’t seen them. I just read that their good for curing migraines if you make a tea out of them so I’d like to pick some up. Thanks! I got the kaffir lime leaves at Food Front Co-op on NW Thurman (off of 23rd). They were in one of the coolers in the produce section in a tiny plastic container (a plastic condiment container). They were only $0.99! Hope they help with your migraines! Awesome I know exactly where you’re talking about, thanks!